The Fourth Plenary Session of the 18th CPC Central Committee, held in late October last year, made a strategic arrangement for national reunification in accordance with the law under the new conditions. To push forward the Taiwan work in accordance with the law is a requirement for comprehensively promoting the rule of law, a need for furthering cross-Straits relations. It also reflects the Party's new thinking on the Taiwan work. With the Constitution as the core guide and the Anti-Secession Law as the backbone, a basic legal framework related to Taiwan has been established, which constitutes an important part of the socialist system of laws with Chinese characteristics. Cross-Straits relations have gone through profound changes since the Anti-Secession Law was passed by the third session of the 10th National People's Congress on March 14, 2005. Rich experiences have been accumulated in advancing the Taiwan work in accordance with the law, which vividly demonstrates how the Party and the government successfully implement the strategy of the law-based governance of the country. 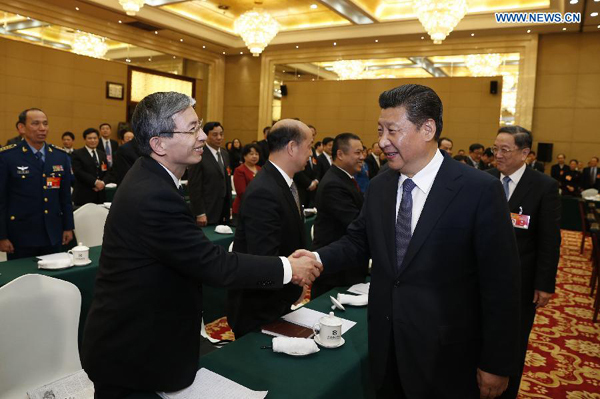 Since the 18th CPC National Congress, General Secretary Xi Jinping has made important remarks on the Taiwan work, including the idea that "both sides of the Taiwan Straits are of one family and should join hands to realize the Chinese Dream", and the recent statement that "both sides of the Straits should unswervingly stick to the peaceful development of cross-Straits relations, stick to the common political foundation, work for the welfare of compatriots on both sides, and join hands for the rejuvenation of the Chinese nation". With these remarks as guidance and the trend of cross-Straits relations in mind, we should carefully plan and press ahead with the Taiwan work in accordance with the law. The institutionalized consultations and negotiations should be strengthened to consolidate and expand the fruits of the peaceful development of cross-Straits relations. On the basis of the 1992 Consensus, both sides should continue the regular contacts and communication between Taiwan Affairs Office in the mainland and Mainland Affairs Council in Taiwan, as well as the institutionalized consultations and negotiations between the Association for Relations Across the Taiwan Straits in the mainland and the Straits Exchange Foundation in Taiwan. The authority of the Constitution and other laws should be upheld and in no case should any secessionist activities aimed at "Taiwan independence" be tolerated. We should abide by the legal responsibility of safeguarding our national sovereignty and territorial integrity, and enhance our confidence in and capabilities of using legal means to safeguard the one-China principle and check "Taiwan independence". Laws and regulations related to Taiwan should be improved and the idea that "both sides of the Straits are of one family" should be fully implemented. We will continue to put people first and protect the legitimate rights and interests of Taiwan compatriots, e.g., to enforce policies and legal measures that benefit people on both sides, to provide Taiwan compatriots with proper treatment for their investment, employment and study in the mainland, and to enhance mutual legal assistance between the two sides. Efforts should be made to enrich forms of national reunification in the course of realizing the Chinese Dream of rejuvenating the Chinese nation. The national reunification we pursue is not only a reunification in a political sense; more importantly, it is the connection of hearts and feelings. With the wisdom of Chinese people and the experience of the rule of law in both Chinese history and modern practice, the common recognition of one China will continue to grow, paving the way for eventual reunification of the country. The author is Minister of Taiwan Affairs Office of the State Council.